The SpeechMike Premium has reached its highest stage of evolution. Benefit from all advantages of the industry leading dictation microphone, without the constraints of a cable. 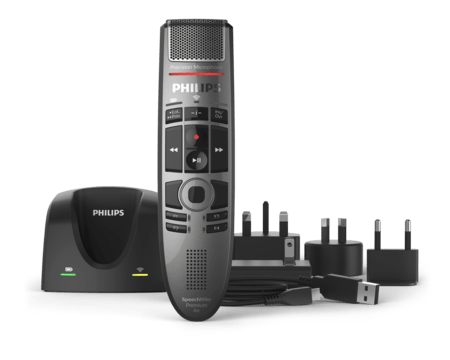 Record your voice using a premium decoupled studio-quality microphone with a built-in noise reduction filter and achieve exceptional speech recognition results. The included SpeechExec Pro Software with integrated speech recognition allows you to turn your voice to text quicker and more accurate than ever before. The SpeechExec Pro Software organizes the workflow of dictation files and resulting documents between author and transcriptionist, and allows you to monitor the status of your work. It comes with integrated Dragon speech recognition software that allows authors to turn speech into text immediately. Texts are transcribed in real-time on the computer screen while speaking. The stable and innovative docking station provides wireless high-speed charging and easy pairing between your device and the docking station. Users can be flexible and work with various docking stations in different places. With an optional foot control connected, the docking station enables hands-free recording. The AirBridge Wireless Adapter (available as an accessory) is a mobile lightweight alternative to the docking station to connect the microphone to a computer. 120 g / 4.2 oz. 276 g / 9.7 oz.